I am always so interested in how an actor is chosen for a certain role, especially a role that involves a display of musical talent. Of course I knew that Anna Kendrick could sing ( Hello Pitch Perfect Cup Song) but I was totally surprised when I heard Emily Blunt and Chris Pine burst into song on screen…...they sing??!! Yes, they do and they were both totally amazing and absolutely perfect in their roles. 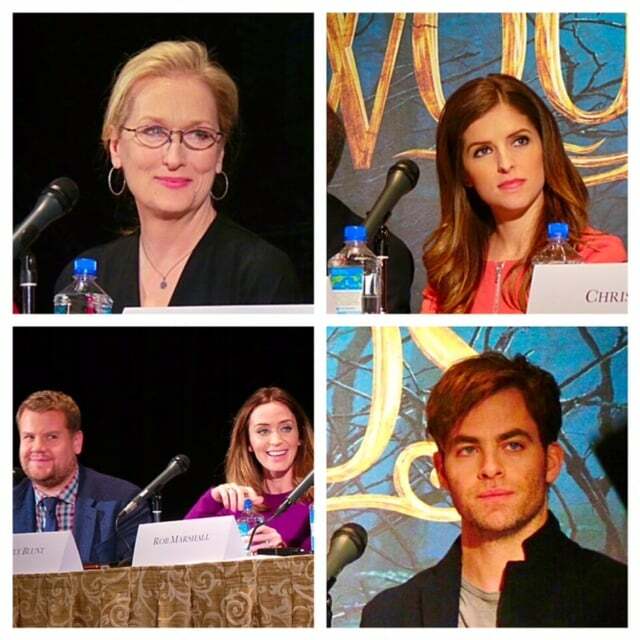 Chris Pine had never even heard of Into the Woods and had only one night to prepare a song for his audition; “I had a night to prepare a song to go sing in Rob Marshall’s living room, and then I made the mistake of going online and Googling what I was getting into, and then it dawned on me the kind of magnitude, you know, the pantheon that was touching with this music.” Chris stepped out of his comfort zone and played the part of the “shallow prince” with humor, making him likeable along the way. During the interview a question was asked of Meryl Streep ( OMG..Meryl Streep in the same room…15 feet away from me ..unreal), Tracey Ullman, and Christine Baranski; ” How did each of you individually prepare yourselves as mothers for this performance?” I had not thought about the roles that they portrayed all being Mothers and how this would have affected their approach to the parts they played in the movie. 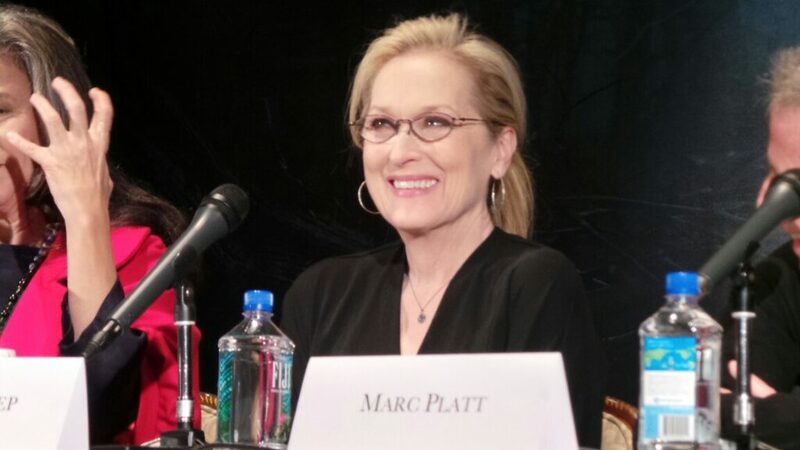 One of the most endearing answers came from Meryl Streep: “Everybody’s story line has something that resonates in a modern heart. I mean the issues that the witch has that the idea that people do very bad things for sometimes very good reasons. So she loves above everything this little blossom of a girl ( Rapunzel) that she never even dreamed that she’d have and there she has this child and she wants to protect her from all the bad things in the world. That’s something that every parent understands.” Hearing this really made me think differently about the character of the Witch. From the view point of a parent it made her actions seem less reprehensible and more relatable. I thoroughly enjoyed the cast interviews. Tracey Ullman and James Corden had the entire audience and their fellow actors in stitches with their witty comments. The actors in this film could not be more perfectly cast, they all seemed to have a genuine affection and respect for each other. Their rapport off screen carries over to the film as well and it makes this ensemble performance beautiful to watch. Be sure to check back tomorrow for a my full review of the film. 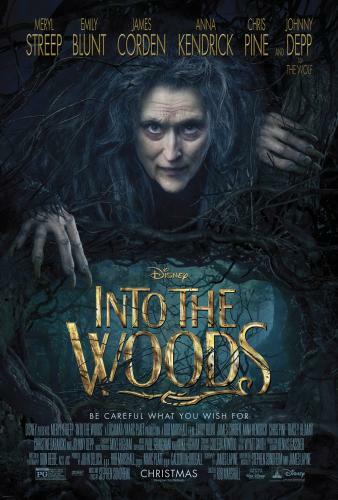 Check out the trailer below and MARK your calendar for December 25th when INTO THE WOODS hit theaters!! Like INTO THE WOODS on Facebook! Follow INTO THE WOODS on Twitter!